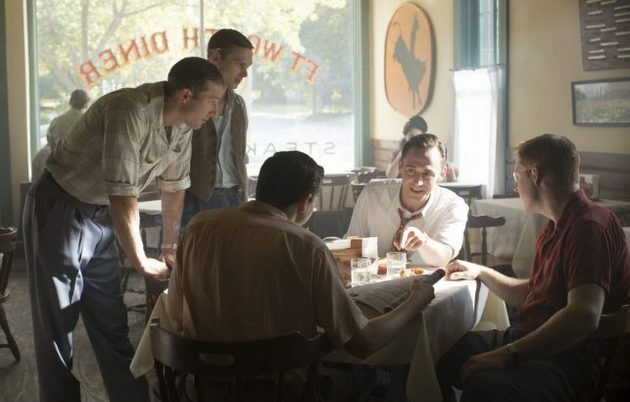 The rest of the world will have to wait until November 27th to see Tom Hiddleston reprise the role of Hank Williams in the much-anticipated film adaptation of Colin Escott’s biography. But the lucky folks attending the Toronto Film Festival this week will get the very first chance to see the film that is already on the tip of many tongues as an early Oscar contender. I Saw The Light will be screened at the Ryerson Theatre at the Ryerson University Friday, September 11th, and then again the next day at the Elgin/Winter Garden Theatre. This will be the first opportunity for critics, taste makers, Oscar voters, and fans to see the film about the iconic country star who died tragically at the age of 29. I Saw The Light has also been confirmed for the Austin Film Festival October 29th through November 5th, but no screening dates or locations have been announced just yet. Meanwhile further revelations have been made about some of the cast of the film, including many of the revered personalities that made up Hank’s Drifting Cowboy Band. Most notably, former professional baseball player turned actor Casey Bond has been cast as Hank’s legendary fiddle player Jerry Rivers. Bond was an outfielder for the San Francisco Giants before transitioning to acting. He did not know how to play the fiddle before being hired for I Saw The Light, but learned the instrument and the songs being performed live in the film for the role. “To learn his songs was incredible,” Bond says. He was also invited to dinner by the Rivers’ family, and played “Hey, Good Lookin'” on River’s original fiddle. Other recently-revealed roles in the I Saw The Light cast include Michael Rinne as Hank’s bass player Lum York, Joshua Brady as lead guitar player Sammy Pruett, Joashua Brady as steel guitarist Don Helms, and Rob Boltin as Hank friend and producer Frank Walker. Other interesting roles cast in the film recently include Von Lewis to play a young Ray Price. Ray was a roommate of Hank’s for a short period, and also took over the Drifting Cowboys after Hank’s passing. Country singer Faron Young also appears in the film, played by Fred Parker Jr. I Saw The Light also stars Elizabeth Olsen as Audrey Sheppard, Bradley Whitford as Fred Rose, Maddie Hasson as love interest Billie Jean, Cherry Jones as Hank’s mother, and Wrenn Schmidt as Bobbie Jett. When Hank marries Audrey Mae Sheppard (Elizabeth Olsen) at a gas station in 1944, success is only a few years away, but Audrey proves a challenge as she replaces Hank’s mother as the prime influence in his career. Though ambitious, Audrey is a woman of limited talent, and Williams is caught between listening to friends who tell him to remove her from his act and a wife who will listen to no one. With fame, Williams grows increasingly erratic in his behaviour as alcoholism and drug abuse begin to take their toll. And yet the story really gets rolling when, at one of his concerts, Hank spies the young Billie Jean (Maddie Hasson), an aspiring singer who will eventually become his widow. I Saw The Light is directed by Marc Abraham, produced by RatPac Entertainment, and is being distributed by Sony Pictures Classics. 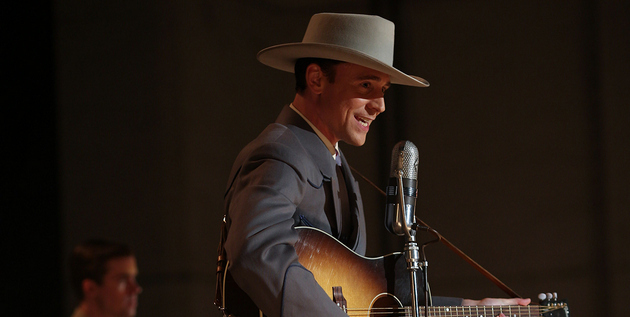 Producers licensed the rights to the original Hank Williams songs for use in the film, and Tom Hiddleston and the rest of the cast is said to perform multiple Hank Williams songs live in the movie. greetings SCM: I am very excited to hear about this!!! I stopped in Coruscant for directions. Turns out I should have turned left at 24601 Valjean… Anyway, they asked why I was traveling and I explained the Earth dilemma of bad music and played some Cole Swindell. Turns out it’s an offense to the Republic to make music that bad, and they wanted to destroy the Earth, but Gary LeVox ate their ships, so you’re all safe… It’s cramped in my tiny ship, with me, Elvis, Liberace, Gary, and Jimmy Hoffa all packed in here. Anyway, we stopped to get the ship repaired at 2332 Kalm and Elvis sang a few songs for them so well they gave us a tune-up for free. Things are going well, looking forward to the biopic. Cheers. Oh thank god Gary ate their ships! I don’t want the Earth to be destroyed, I was about ready to send a distress signal to the Doctor. Well don’t have to worry now, send Gary my thanks. Also hopefully the ships he ate belong to the Daleks, that’ll teach them….hopefully…probably not, but if the Doctor isn’t around, send Gary and he’ll exterminate the alien fleet of ships! By eating of course…. I doubt this movie will draw as much attention to traditional music like “O Brother, Where Art Thou” did, but it will be nice for people to get some exposure to Hank’s music. Hey Trigger, I know Rodney Crowell helped Tom Hiddleston with his singing, but is there any information on who is producing the music for the movie, or whether a soundtrack is in the works? I laughed at myself for tying that because it was the stereotypical thing you would see in a sentence like that. Probably should have taken it out. Guess I left it in for my own amusement. If you used the phrase, “self-styled taste makers,” it’d probably be ok. Thanks for the article. I’m looking forward to seeing this movie. BTW. It’s “Cherry” Jones, not Cheery” Jones, who plays Hank’s mother. She’s an amazing actress, probably best known for her stage work. So they cast a British actor to play Hank & are set to screen the movie in Canada.Correct me if I’m wrong but wasn’t Hank an American icon? On the other side though, Robert Downey Jr did played Charlie Chaplin in the biopic Chaplin way back in 1992. Just pointing that out, not looking for any drama. Its cool just thought I would point out a bit of irony.I think a lot of Hollywood is secretly British just look at the cast of “The Walking Dead”. This might be an odd question, but what’s the target demographic for this movie? As in, what’s the content looking to be like? R-rated or more family friendly. Unfortunately, if it wants a legitimate shot at any Oscars it’ll have to be gritty and “mature.” Otherwise a nomination is all I would hedge my bets on. Side note, but I like Hiddleston’s resemblance to Hank in that photo. At least he looks the part; all of the shots of the fedora were throwing me off. The target demographic is everyone. From script to screen, this movie is meant to be a blockbuster, and meant to get nominated for Oscars. It is a vehicle for Marc Abraham to build his film legacy on. Don’t know the rating, but no, it won’t be specifically appealing to families per se. I expect the portrayals to be pretty accurate.